Sidney Crosby was able to reach the milestone of 1000th point. Even with missing a few games at the beginning of the season. 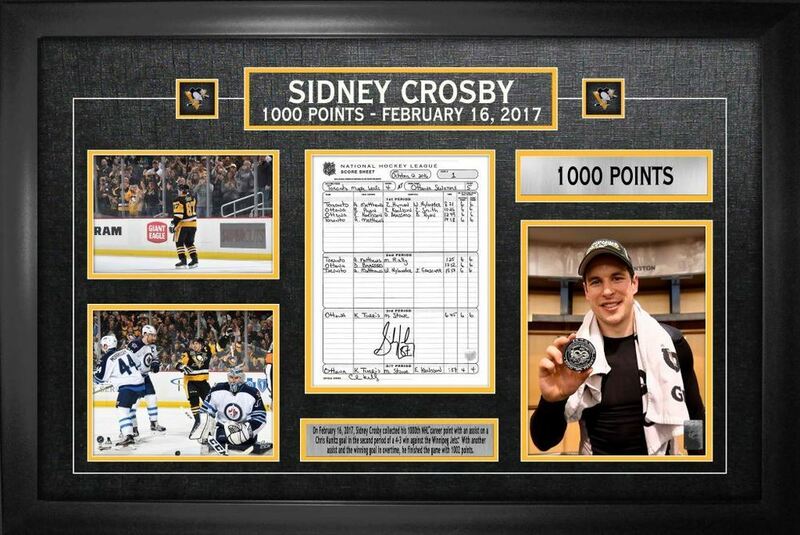 This framed piece features a scoresheet from the February 16th, 2017 game in which Sidney Crosby recorded his 1000th point. The scoresheet was hand signed by Crosby himself and is surrounded by three photos of the superstar centre on the historic day, as well as a metal plate describing the events of that night, and two team collector pins. Includes a Frameworth hologram and certificate of authenticity. Finished Size: 24x36"